Challenge your kids to expand their vocabulary and improve their spelling with this fall themed literacy game. It was inspired by Scarecrow theme for our collaborative project Teach Second Grade. I am an Amazon affiliate, and this post contains an Amazon affiliate link. For full disclosure, click here, and thank you for supporting my blog! I loved playing this game when I was a child – picking up a long word and then competing with a friend or a parent to see who can think of more words that can be made out of the letters of this word. 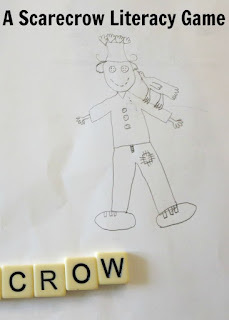 I thought that for our scarecrow game we could add a bit of fun by drawing one part of a scarecrow each time we came up with a new word. 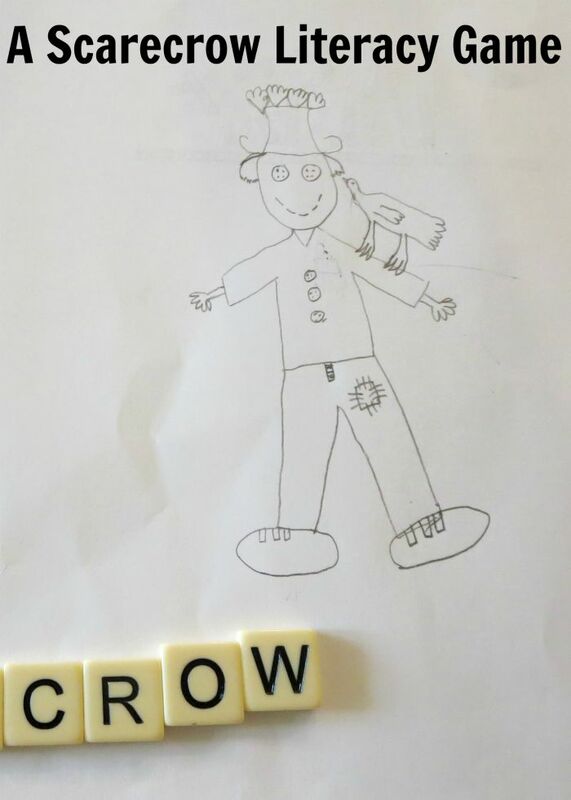 I prepared this simple “make a scarecrow” printable for us to use in a game, but our printer broke down, and we just used blank sheet of paper and letters from our Bananagrams game. Smarty really enjoyed playing this game. It tickled her competitive bone, and she wanted to draw a very detailed scarecrow. Normally, this game is played with each player writing their own list in private and then comparing the lists, but we chose to play it by taking turns with the objective to find the word that was not used before. eventually, we tied with 19 words each, 38 words total. I noticed that Smarty was a lot more fluid with this game than when we tried it in the first grade. These kind of games can be great boredom busters while waiting in the restaurants as well, and I think we will be playing it more often now. Do you play these kind of games with your kids? So far I was able to at least tie, but I expect Smarty will be beating me soon! Scarecrow Syllables for Second Grade from Look! We're Learning! We haven't done a game like this for a long time. Thanks for the reminder! I remember having a love hate relationship with that game because I'm not very good at word games so I was never particularly good at it. But like Maryanne said, thanks for the reminder of this game. Yep, that's one I need to put back into our fall rotation!